Ruckley’s story of Rogue picks up pretty much where 2000 AD left him — heading out on his own to solve the mystery behind the battle in the Quartz Zone that killed the rest of his team. Fans of the original series will delight in the respect and attention paid to story continuity while new readers are able to drop right into the action with very little history needed to understand Rogue’s drive and personality. 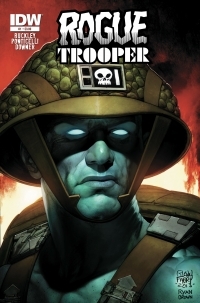 All of the clever storytelling in this revival of Rogue Trooper is showcased by the gritty artwork of Alberto Ponticelli (Unknown Soldier, Dial H) who takes the classic 2000 AD look of Rogue up a notch. His battle scenes are so vivid that you can almost hear the clatter of weapons and the wave of falling debris, but the human expressions Ponticelli creates stir empathy in the reader without appearing overworked. Thanks in part to Brian Ruckley’s background as a novelist, Rogue Trooper #1 is a great example of subtle character-building. Sure, the action is heavy — it is essentially a war comic after all — but all of Rogue’s reactions give the reader clues to the depth of the personality and the emotion of which the super soldier possesses. I look forward to seeing how Ruckley uses this skill in future issues.